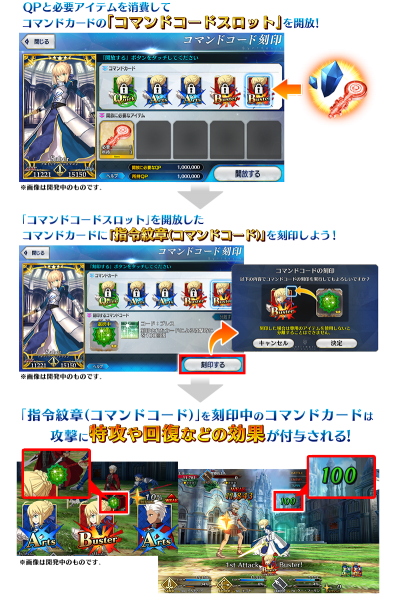 Command Code is a new game system revealed on the Fate/Grand Order Fes. 2018 ～3rd Anniversary～ livestream. It is a way to modify your Servants to gain additional effects. Engraving a Servant's Command Cards with a Command Code will give it a symbol when it is available. That command card has permanent bonuses, such as healing or increased damage. Code Remover; this unlinks it from the Command Card and allows it to be engraved on a different Command Card. Command Codes can be obtained from Friend Point Summons, Da Vinci's Workshop, and through events. ※Aŋra Mainiiu counts as a 2★ Servant. Mash Kyrielight counts as a 3★ Servant even if she has been upgraded to 4★. Inflicts Poison with 600 damage for 3 turns to enemy when attacking using the engraved card. Gains 2 critical stars when attacking using the engraved card. Increases damage against enemies with Charm debuff by 20% of the engraved card. Increases damage against enemies with Lawful Alignment by 20% of the engraved card. Increases damage against Ruler enemies by 20% of the engraved card. This page was last modified on 4 August 2018, at 14:53.